We chose to stay at Le Bastidou with friends to celebrate an important birthday milestone. We were blown away by the house, its location and the amazing Fred and Sophie. The house is beautifully presented with everything you could possibly need and despite our October arrival, the weather was outstanding so we could enjoy the BBQ, pool and outdoor space to its full potential. We will certainly return. Thank you so much ! We have never been to the area before and our expectations were high. 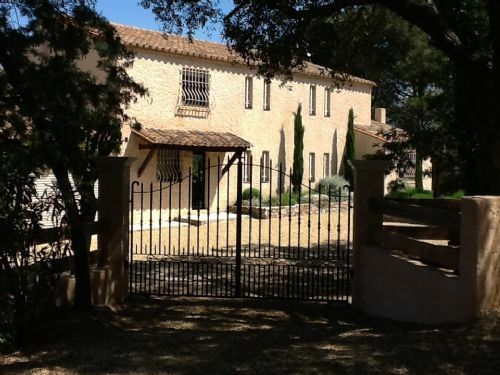 Le Bastidou is a beautiful house in a quiet area on the outskirts of the village of Plan de La Tour. It is very well appointed, clean and has a beautiful swimming pool and garden area. Le Bastidou is well situated outside St Maxine, and the house feels like a home and not a rental at all. Well-stocked, nicely appointed and easy to relax in. Sophie and Fred are only a text away for anything you may need, and they are super lovely people. If I were to suggest any improvement at all, it would be to upgrade the upstairs bathrooms and add a few luxury bath products to compliment the total environment. House was on good location. We were a bit surprised of finding a ball of hair in one of the bedrooms, so it wasn't very clean. We tried to call the housekeeper one time and she didn't get back to us in the firts 24 hours... . So overall there were some points that weren't very satisfying considering the price we paid. We spent two weeks relaxing at the beautiful Le Bastidou. The villa is gorgeous. It was great that each bedroom had its own shower room. We loved the open plan , contemporary feel , the quiet location and the fabulous pool. The beaches at St Maxime are only 15 minutes away but we preferred to head a bit further along the coast to Pampelonne and Gigaro which are about half an hours drive. Plan de La Tour is a very pretty village with every possible amenity including a cash point machine, two mini supermarkets and lots of bars and restaurants. We really enjoyed Pizza Pierrot and the creperie for simple, unpretentious suppers. The Thursday market in the village is a must. Great villa, well furnished. Great service on arrival from owners's local representatives. Beautiful gardens and pool. We had an exceptional holiday. The house was immaculate, every mod-con we could ask for! The garden and pool area was beautiful and all very child friendly. Wonderful staff, very helpful and friendly.